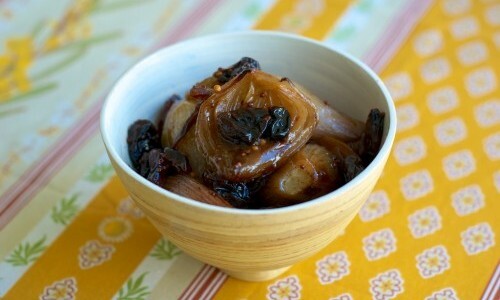 This sweet and sour chutney, adapted from a Nigel Slater recipe, is simple to make and extremely versatile. The chutney can be served with roasted meats, fish, pasta dishes, or it can be tossed with some salad greens, cheese and toasted nuts for a light lunch. It’s also great as a sandwich condiment. 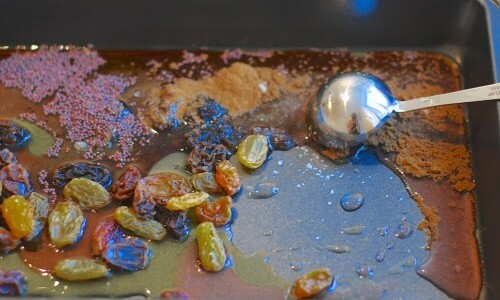 What follows is more a formula than a recipe, so once you have the proportions down, you can go to town on variations. 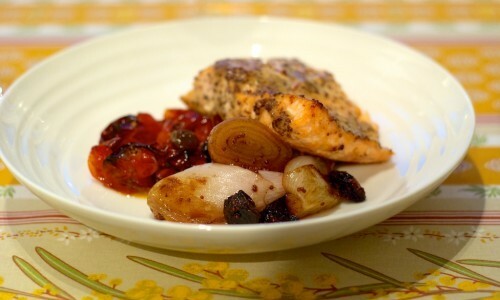 A nice late summer version swaps out the shallots for small tomatoes, the raspberry vinegar for sherry vinegar, the black mustard seeds for yellow ones, and the five-spice powder for a spoonful of herbes de Provence. Put the olive oil and butter into a roasting pan and pop the pan in the oven for a few minutes to warm up. Peel the shallots (it’s easier if you boil them for 5 to 10 minutes in a pot of water first). 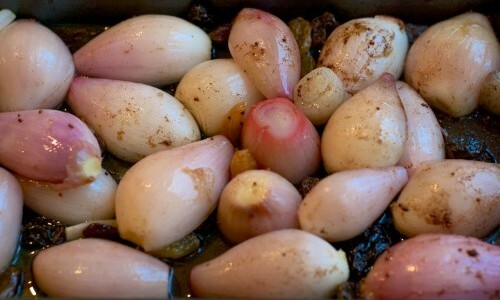 Depending on their size, cut the shallots into halves or quarters, or leave them whole. Toss them in the roasting pan with the warmed olive oil and butter and the rest of the ingredients. Roast for 50 minutes or so, stirring occasionally, until the shallots are soft and the whole mess is nice and sticky. Adjust seasoning, adding more salt, vinegar or sugar if needed. As well as being delicious, the chutney keeps well for several weeks in the fridge. If you have the space, you’d be well advised to make a double batch. This entry was posted in recipe, sauces & dips, veg. Bookmark the permalink.